I feel like this all the time in Xcode 4. I have been using XCode 4 for quite a while now and while I love the fact that Clang and all the back end smarts are much nicer, the interface has really taken a retro-grade step in my opinion. I recently had to go back to XCode 3 to do some stuff and wow it was soooo much faster to get around and do stuff. There is now so much pane management in XCode 4. For instance lets consider doing a find across your project. In XCode 4 you hit cmd-shift-F, enter your find text and hit return. Then you have to go drag the find results sub-pane bigger… then look through all your results. Then when you find something interesting you have to double click on a result to look at the find instance (being very careful not to single click it or else the main bit of code you were looking at to provide context to your find disappears). Then when you finally found what you want you have to dismiss the new windows you created, then resize the find column back to something you use for eg a stack trace / build results / whatever (Debug Navigator / Log Navigator) and then go on your way. I just wanted to say that several people have been emailing me about MacHg and progress. As many of you have seen the public amount of work I have done on it has dropped off in the last number of months. Well the explanation is simple my normal paying job right now is ramped up and so all my normal time (as always), is spent on that and in addition all the spare time that I can reasonably muster is also spent on that at the moment. Its really exciting stuff. In any case when that calms down in the near future I will be adding some features and polishing others in MacHg that I have long planned to do. Top of the list is the “jiggling” of the graph as one scrolls… I actually have something working internally but there are kinks to iron out. I rewrote things completely in MacHg only to find out that some child accessing is O(n^2). This was a real pain and I tried to get the Mercurial guys to have nice ways around this for GUI writers like me, but no dice. Thus I have had to work around this in a messy and un-ideal way. Still it working in my internal prototype builds. 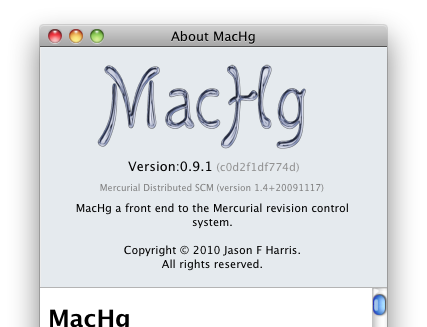 A user of MacHg (Marko Käning) wanted to be able to see the changeset hash in the About MacHg box (see here). I had been meaning to do this at some stage and, well, given the request, now seemed as good a time as any… It turns out it was quite easy to configure XCode to create the appropriate information while building MacHg. As part of the build process, get the hash key automatically and insert it into the applications info.plist. Under targets select your application. Change the shell to be /usr/bin/python instead of /bin/sh. print "Error in obtaining current changeset of the Mercurial repository"
print "Current changeset of the Mercurial repository is malformed"
Then it’s just a matter of styling it and viola, you have the ingredients for versioning your application with the Mercurial changeset hash key. Actually, after doing this I found out that over at Cocoa is My Girlfriend he had done something similar but in bash. Previously .plist files were all stored as ASCII files but in OSX 10.4 Apple started compressing them. If you attempt to diff one of these compressed .plist files in FileMerge it complains that the files are binary and should it proceed anyway. If you do proceed you get a comparison between garbage and garbage and you can’t see any of your changes to verify that you made the right changes in Xcode. Anyway I had googled for a solution but didn’t find one easily. But recently this annoyed me enough that I overcame the thresh-hold of annoyance and looked for a solution. (likely you are reading this post for the same reason!) 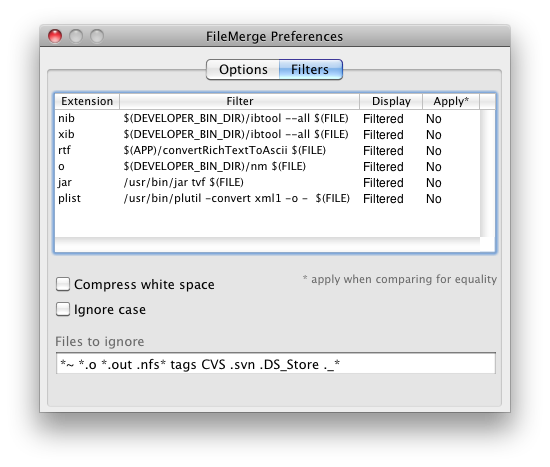 So it turns out that its pretty easy to get FileMerge to nicely display diffs of .plist files. You need to add a simple filter to FileMerge. You can do this by hand. ‘plist’ in the extension column. ‘/usr/bin/plutil -convert xml1 -o – $(FILE)’ in the Filter column. ‘Filtered’ in the Display column. Thats it. Go do some diffing! Right my first blog post!